I first saw Dr. Frank Luntz on a 2008 episode of Bill Maher’s Real Time1. Ever since the interview and the subsequent panel discussion, I’d been referring to the concepts in his book—Words That Work—despite having never having actually read it. I decided it was past time I corrected that2. 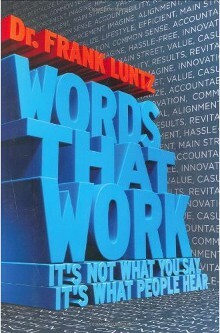 Luntz’s message in Words That Work is extremely simple: it’s not what you say, it’s what people hear. It’s so central to the book, he repeats it twice in his introduction and closes the book with it. You’ll read it a total of 26 times, almost twice per chapter. In addition to mere repetition, he explores this point through statistics he’s gathered over years of research on America’s populace, through a lens as both consumer and voter. While it may seem like a simple idea, Luntz regails us with tale after tale of companies, executives and candidates who forgot or ignored this simple idea. In effect, positioning an idea doesn’t merely “frame” it so that it carries a certain meaning; it actually defines the terms of the debate itself. The language lesson: Focus on results, not process. If it’s really true that good release engineering is one part politics and two part communication, with a pinch of coding thrown in here and there, understanding these insights is certainly useful. One bit of Luntz’s approach that may stir up some cynicism among readers is his (thinly veiled) political leanings. He spends the good part of a chapter describing how his techniques apply to all ends of the political spectrum, and that it’s important for anyone engaging in a debate to set aside their position for a moment and try to understand the fundamental points about communication he’s trying to make. But when you look at his examples—penning the Contract With America, writing the pro ballot argument for Gray Davis’ recall, working with accounting firms in the wake of the Enron scandals, contorting the “estate tax” into the “death tax”—it’s obvious who his clients are and who they’re targeting. The numerous and constant examples left a little voice wondering whether his conclusions were biased by the conservative slant in which much of his research has been conducted. Having said that, it’s hard to contend that his major points—”it’s not what you say, it’s what people hear” and framing the debate matters—are incorrect. And while some of his case studies may make you cringe (and may require some serious translation to how they would apply to a situation that doesn’t involve voting for a Republican candidate), Luntz’s book provides useful tips to improve your ability to make sure the message your audience is hearing is what you’re intending, whether it’s in a convention hall or a conference room.